Our office in the Chicago area is equipped with the latest technology in diagnostic and examination equipment. 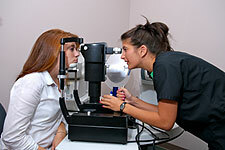 This allows us to provide our patients with the most thorough, comprehensive eye examinations available. We thoroughly check the internal and external health of your eyes including tests for macular degeneration, cataracts and glaucoma. Our physicians also check for the presence of corneal disorders and will examine the retina to ensure proper health and continued good vision. Mary Szatkowski-Pritikin, M.D., offers an array of services in a comfortable, relaxed atmosphere. Our skilled doctors and friendly staff provide the highest quality care using the most sophisticated technology available and are dedicated to helping every patient enjoy the best possible vision. Over 30 million Americans wear contact lenses, according to the American Optometric Association. Unlike glasses, contact lenses move with your eyes so you can enjoy a larger field of vision with fewer distortions. You also don't have to deal with frames hovering in your peripheral vision or external lenses that fog up on cold days or get wet in the rain. There are many different kinds of contacts, including rigid and flexible, extended wear, disposable and planned replacement lenses. Some can be made as bifocals or in different colors. After a thorough eye exam and consultation with an experienced physician, patients who qualify for contact lenses can discuss which type is right for them. All contact lenses require special care and cleaning. You'll need to make regular follow-up visits to ensure your eyes remain healthy.